Jill Kay Chronister, 68 of 103 Cottonwood Dr. Seneca, SC went to be with her Lord and Savior on Monday, January 14th, 2019. She was born October 12th, 1950 in Dearborn, MI to Richard & Joan Ballard. She was married to Gary Chronister of the home. Jill was a retired hostess and loved everyone she met with two legs and especially those with four. 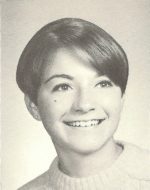 Jill was preceded in death by her parents, Richard & Joan Ballard. She was survived by her spouse, Gary Chronister, daughters, Elizabeth & David Oglesby of Seneca, Megan Sellers of Elizabethtown, NC, a son-in-law Dempsey Sellers of Wadesboro, NC, brother, Kirk & Rosemary Ballard of Mooresville, NC, a sister Kitt Ballard of Mooresville, NC, nieces, Rachel Ballard of East Point, GA, Becca and Katie Ballard of Mooresville, NC, and Duke Ballard. Funeral Services will be held 11:00am Friday, January 18th, 2019 at Ramsey Creek Preserve Chapel, with the family receiving friends from 10:30-11:00am prior. With natural burial to follow on the Ramsey Creek Preserve in Westminster, SC. In lieu of flowers memorials may be made to Hospice of the Foothills or Oconee Humane Society. Brown-Oglesby Funeral Home is assisting the family.